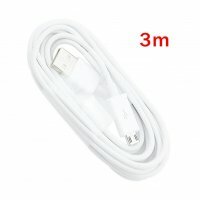 View basket “Universal Micro USB Data Charger Cable 3 Meters” has been added to your basket. Support most android devices which with micro USB port. Compatible with Samsung Galaxy S6/7, Samsung Note 4/5, Nexus, LG, Sony, HTC, Motorola, Kindle, Nokia and more. GOES TO GREAT LENGTHS TO SIMPLIFY CHARGING Micro USB cable is 3 meter long. The cables suit most occasions , home, office, car and so on, make your life more convenient. The Micro USB Data Cable provides high-speed USB 2.0 data transfer rates, while simultaneously charging your phone through your computer’s USB port. High Speed: Charges up to 7% faster than standard cables and transfers data at 480Mbps via USB 2.0. Extra Durable: Original 8-pin connector with Tangle-free nylon cord has a 4000+ bend lifespan several times. Reversible design, ultra compact, light weight, and easily coiled. Sync & Charge : Sync and charge at the same time at the fastest speed on your windows PC or Mac. The cables core and the multi strand copper core ensure superior data transfer with fast and stable charging. made from high-grade tinned copper. Warranty: Every item you ordered from aLLreLi can enjoy a free replacement or full refund within 12 months. If you have any questions or problems, don’t hesitate to contact us! LIFETIME WARRANTY! aLLreLi Micro USB Host on the go OTG Cable – Micro USB B/Male to USB2.0 A/Female OTG Host Cable OTG function. It should also work with non-power hungry card reader.